These gruyère and cheddar tacos are so good! With beef, cheese and fresh vegetables. Ready in about half an hour, recipe for two people. CLEAN the spring onion, cucumber, red bell pepper and ripe tomato. SLICE the vegetables into thin slices. REMOVE the seeds from the red chili pepper and cut into thin slices. PEEL the red and yellow onions, then dice. CRUSH the cloves of garlic and cut into thin pieces, set aside. Prepare the prawn cocktail sauce. GRATE the Gruyère and cheddar cheese into a bowl. HEAT up the large skillet. ADD in olive oil, sauté the white onion, red chili pepper and garlic. 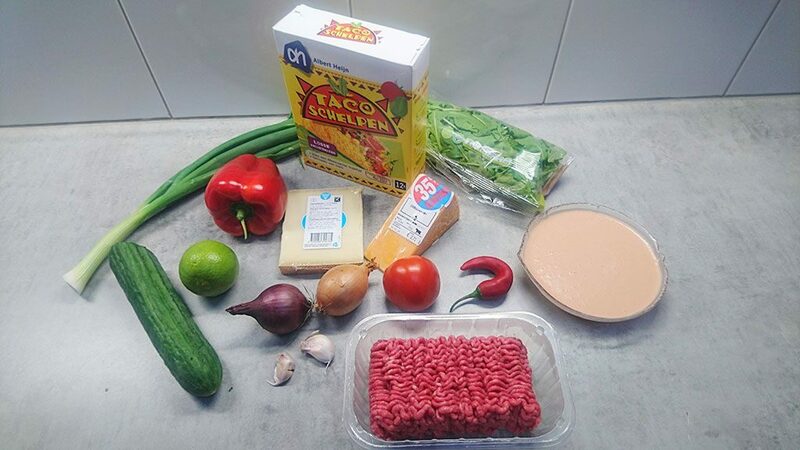 BAKE the minced meat until browned. 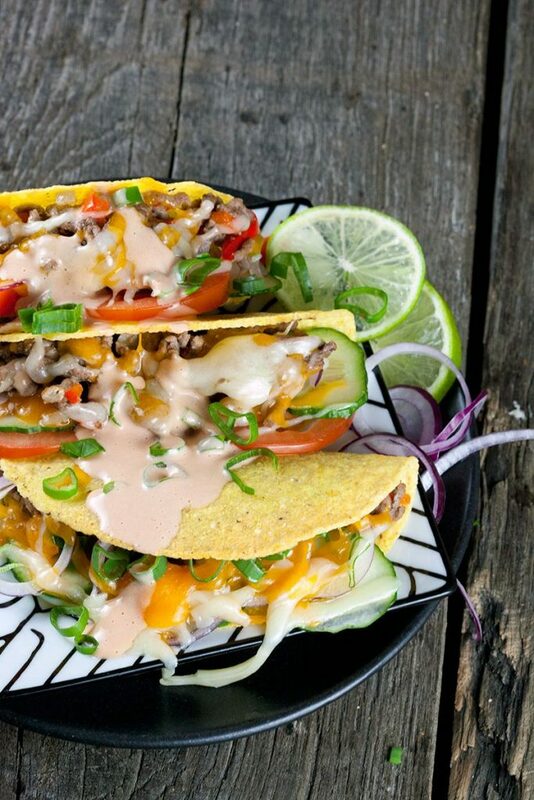 FILL a hard shell taco with ground meat, vegetables and top with grated Gruyère and cheddar cheese. 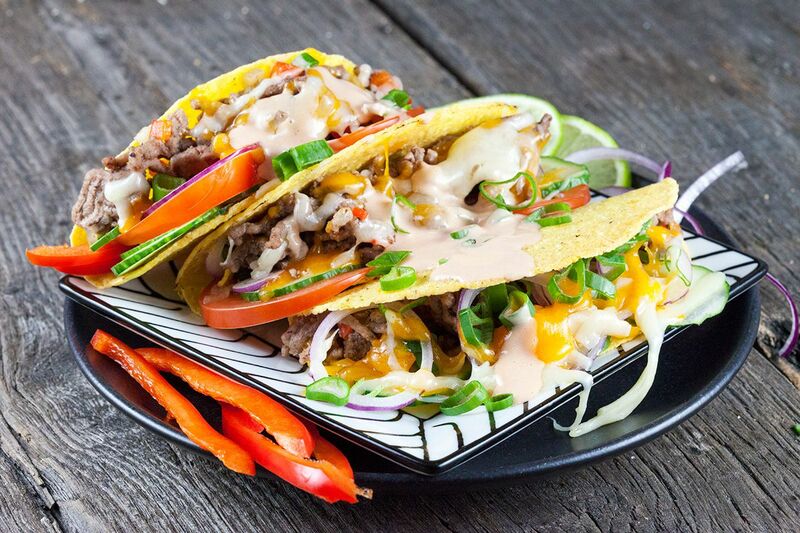 PLACE 2 – 3 tacos on a plate and melt the cheese using the grill setting on your oven. Serve with a home-made prawn cocktail sauce with whiskey and garnish with the spring onion and lime, enjoy! The tacos look delicious. I’ve never thought of using Gruyere in tacos … Monterey or Pepper (Jalapeno) Jack are my usuals if I remember to pick them up. 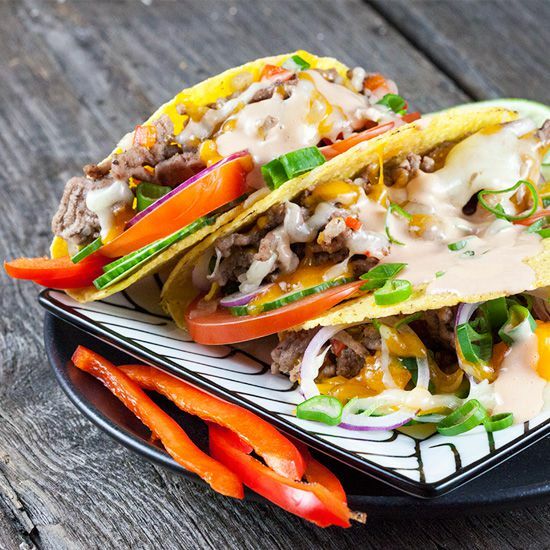 As a self proclaimed Taco Queen, I’ve gotta say that these look ahhhhmazing! Love the little twists that totally amp them up. Gotta try these soon!